On Monday, my friends and I decided to make pizza rolls. I wasn't following off any particular recipe or instructions, it was simply an idea that I'd seen floating around online and decided to cook myself. This was our first time cooking them, we didn't have a while to cook them (we ate them for lunch) so we used pre-made dough because making dough would've taken too long and been too difficult. The result was great, you can add any thing you'd prefer but the way we did it is credible, I was very proud. •Any pizza topping(s) of your choice, I used pepperoni. •A casserole dish, I used a glass Priex dish. •Dough, I used Jus-Rol pizza base dough. 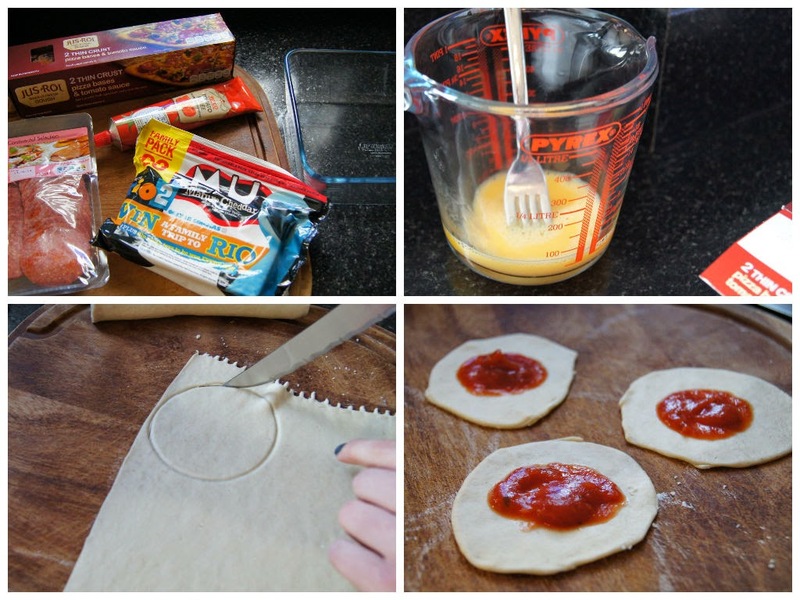 •Tomato purée, my dough came with tomato base sauce. Step 1: You can prepare all of your ingredients now. Your dish will need a light rub of cooking oil and you'll need to crack one egg into a bowl/jug and whisk gently for an egg wash. The cheese will need cutting into little blocks and the pepperoni into quarters. Preheat the oven at about 180° (fan) Gas Mark 6. Step 2: Roll out the dough and cut circles about the size of the rim of an average glass. By the end of this we just started cutting squares because we didn't want to waste any dough. You can do either. 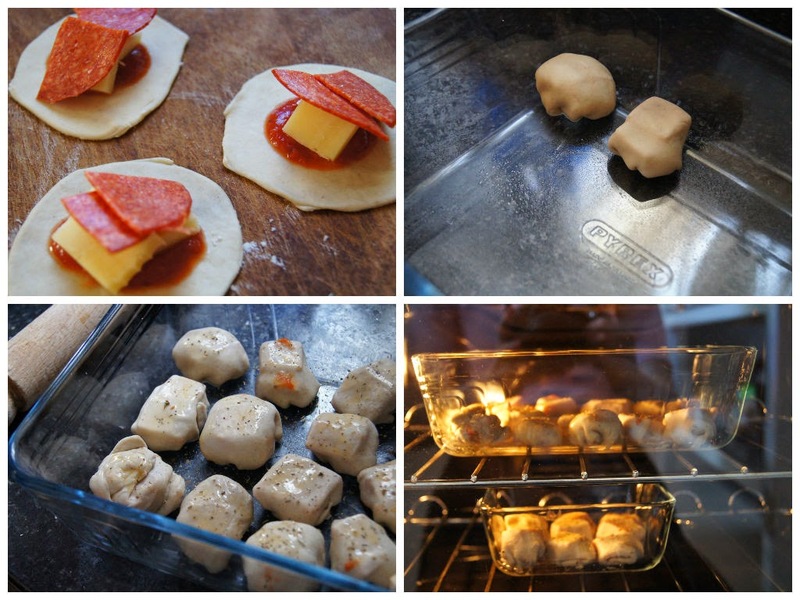 Step 3: Using tomato purée or pizza base sauce you need to smear a small blob in the centre of the dough shapes. Step 4: Place the cheese and topping on top of the sauce, trying to keep it all centred. Then fold all the edges to the centre in order to close the wrap. It's OK to stretch the dough, as long as it doesn't split. Step 5: Continue them steps until you've got as many as you'd like and used all of the dough. Place the dough balls in the dish with the fold gathering downwards. It's important for them to be spaced out and not touching each other, if they do, they may merge whilst rising. Step 6: Swipe over a even coat of egg wash, but not too much. You can use an oiling brush for this, or even just a table spoon. The egg wash gives a golden and crispy finish, it is optional. Step 5: Sprinkle over some salt, pepper and mixed herbs/Italian spices. This is optional. Step 6: Place in your preheated oven for 20-25 minutes - until golden. Then, Voilà! These are delicious and great if you're having guests.